Am I In The Video Gaming Elite Yet? Last night, the family and I went to the local arcade, 1984, and played video games. 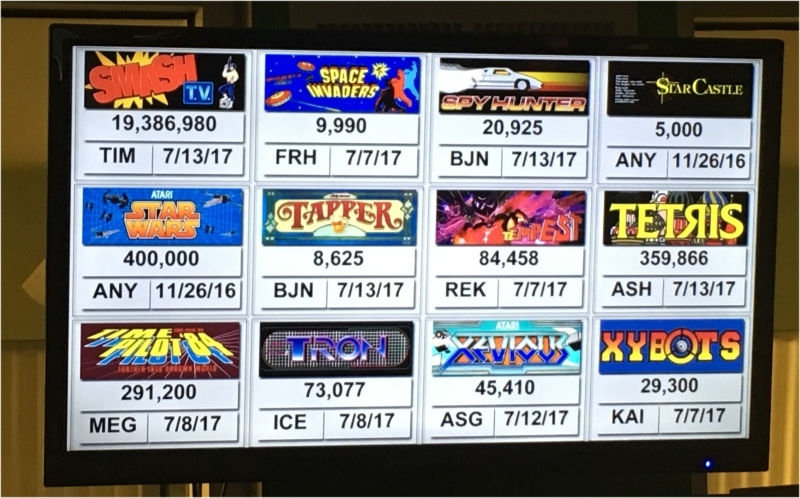 1984 has an electronic leaderboard of the monthly high scores, and if you get the monthly high score on the video game, you get a free pass for a future visit, your initials in a slideshow that displays on two big monitors, and a button. Spy Hunter and Tapper had the default values, 20000 and 8000 respectively. I played a couple games of Spy Hunter to make sure I surpassed the threshold. The first game of Tapper I played I beat the minimum, which means that not many people have played it. Perhaps because it is a cocktail game, one that you sit at (although a cocktail game about tapping beers seems somehow wrong). So I got my button and my free pass. The button, though, represents my second award for a video game high score. Way back in 1987ish, the Arnold Bowl, where my mother was on a bowling league, had a promotion where they’d award trophies for monthly high scores on some of the machines. As with my later trip to 1984, I cherry-picked and looked for the machine with the lowest high score on it. Strangely enough, this was Pac Man on December 30. Perhaps it was not as popular of a game some seven years after its release. Perhaps someone had unplugged the machine. It was ridiculously low, and I managed to surpass it. My high score held up for a day and a night, so I got a trophy. 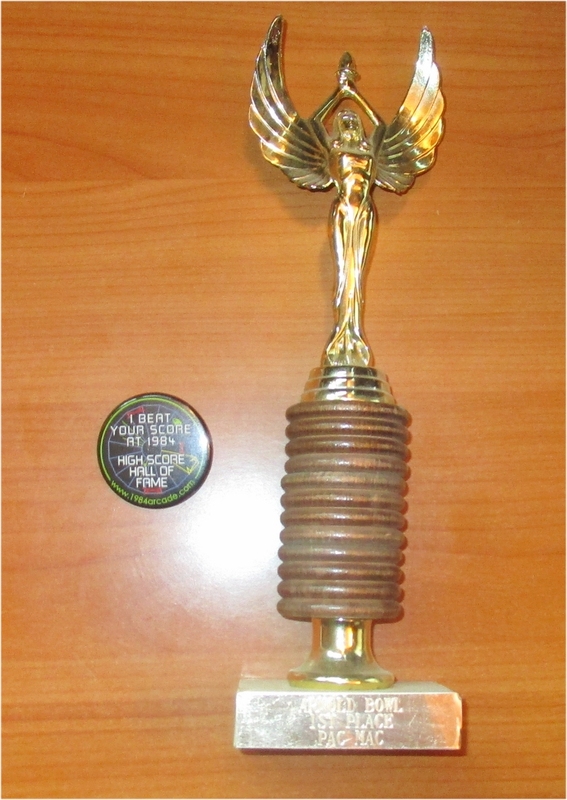 A trophy with an engraving error. Funny thing that: My sainted mother won a trophy of her own for being the most improved bowler in the league, and the trophy shop at the bowling alley managed to misspell improved on her trophy. So of the Arnold Bowl trophies our family accumulated, they were 0 of 2. At any rate, it’s kind of funny. At some point, I stopped really getting into video games. I might have been confused by the complexity of the NES controller. I haven’t really played them that much, and I spent a lot of time in 1984 last night just wandering around. Thirty years ago, playing all you wanted in a video arcade would have been a dream come true, but last night, at least until I decided to try for a high score, it seemed like it was going to be a long slog of a night. Perhaps it’s the video game selection at 1984. I might have matriculated into the video game scene a little later than its titles skew. If it had a Double Dragon, an Ikari Warriors, or a Heavy Barrel, I’d be on it. Of course, I spent most of my time on the Arkanoid they have, which is sort of silly and embarrassing with how little skill I have at it, since I’ve got one standing here in my office less than four feet away but that I don’t play but a couple times a year. At any rate, BOW BEFORE MY VIDEO GAME SUPERIORITY! The trophies are only slightly better than participation trophies, BUT THEY ARE SYMBOLS OF MY PROWESS! In other news, my beautiful wife also got a high score, but hers was for the game Joust which other people play and whose commemorative button represents actual skill and effort.